My good pal, Sandye did the unthinkable-moved to Houston when her husband acquired a new job. She also acquired a new baby (after 9 months of pregnancy, and who knows how many hours of labor (I'm not allowed to ask those sort of questions, I want to want to have one or 4 of my own someday, so....it's best not to know)). I saw him last week. He's precious. He's walking. 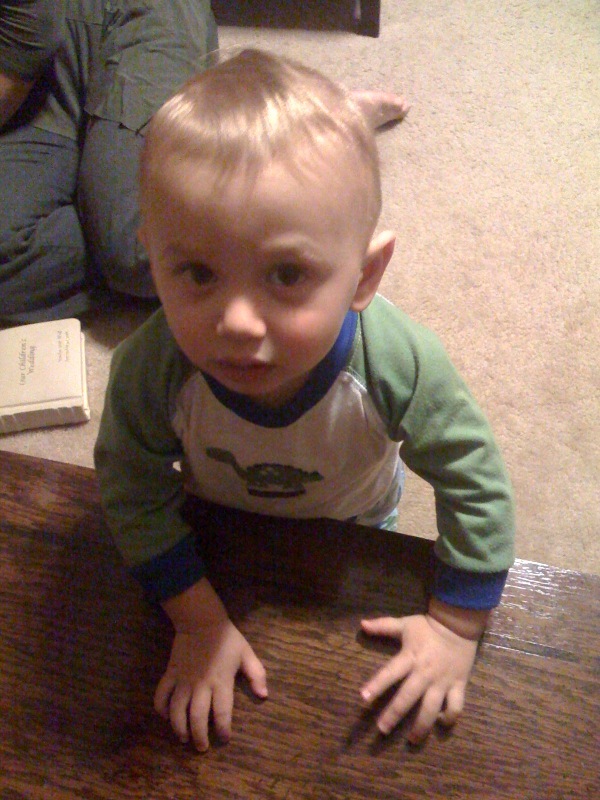 He speaks baby Spanish (thanks to his Daddy's heritage, and the language spoken to him at home). I can hardly speak baby anything, so when you throw in the Spanish babbling version, we just looked at each other and smiled. He used a lot of hand gestures. There was a point where he punched his fist into the air while he babbled to punctuate his point. Whatever that may be, I hope it's good. I can't wait to see him again. Come back Max, I'm really good at spoiling! 2. Have you heard this new song by Amy Grant? I love it, and it speaks to me. God's lessons sometimes hurt, but after 2++..ok... + decades of learning, I can say without a doubt, all the pain has a purpose. It's hard to find it in the moment, but this song is such a hug! Amy, creative gal extroidanaire, made these cute rings for all the guest. She said she saw the tutorial on Martha Stewart. So fun! There is a new bakery called Elizabeth's Bakery Maggie arranged to grab some cupcakes from for our desserts, and I'm really digging these festive colors, and the mound of icing. 4. For the first time I went to THIRD Monday Trade Day in McKinney. I'm hanging it from my grandfather maple out back(just made that up...grandfather...psssh). The tree used to house 5 different size/shaped glass and brass lanterns I loved up until the point the branches broke in a storm, ooops. I found a couple of other really cute things, and I'll go back for more....much more....sometime soon. There is also a whole row of puppies, and it made me sad b/c I didn't want them to be there. I want them to all come live in my house, but there are, like, city codes against having 643 puppies at your house. 5. Last, and perhaps most importantly. I won glitter on a blog giveaway! She also included a really adorable card she crafted with her glitter. I'm off to glitter every other object in my house now....every other object b/c the 'others' have all been sprayed with chalkboard paint and are still drying. That...or I'll sleep with the jars under my pillow b/c I like glitter...a lot! Fun seeing you yesterday. I attempted the cini minis. We'll see what comments I get today at work.